With 2015 coming to a close, to understand and start strategizing for the next year, we must look back on the year and gauge the industry’s progress. A lot has happened this year and there is a lot to look forward to in 2016. 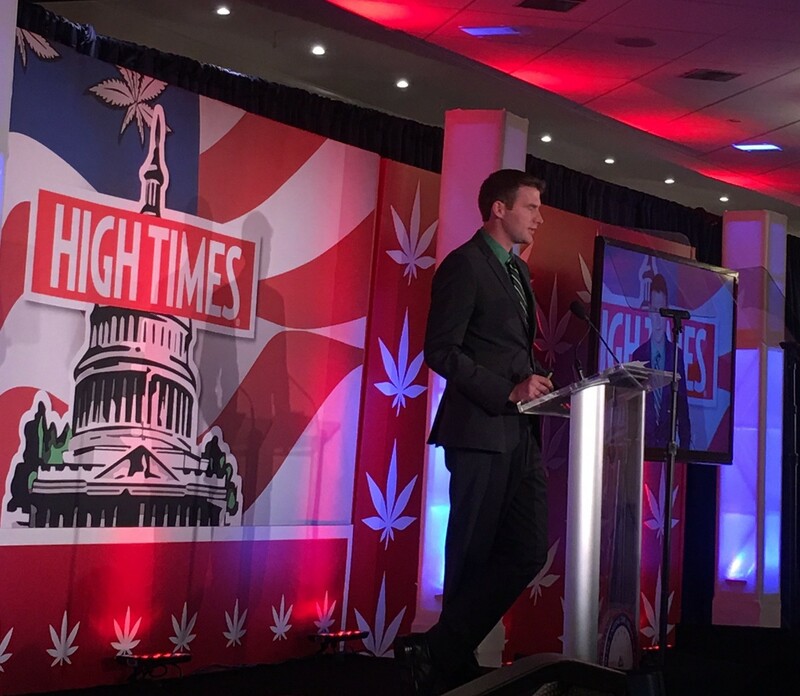 Nic Easley presenting at the 2015 High Times Business Summit in Washington, D.C.
Nic Easley, founder and CEO of Comprehensive Cannabis Consulting (3C), gave a presentation at the High Times Business Summit last week, reviewing the cannabis industry’s progress in 2015, and providing some insights on what to look for in 2016. 3C is a national cannabis and hemp consulting firm dedicated to ensuring the highest standards in large-scale, sustainable organic production and product manufacturing. Over the past eight years in Colorado and nationwide, Easley has helped more than 60 clients design, build, start up, and optimize their operations. Easley is an active participant on multiple committees in various industries, non-profit groups, and rule making organizations that are setting the standards and regulations guiding this industry. 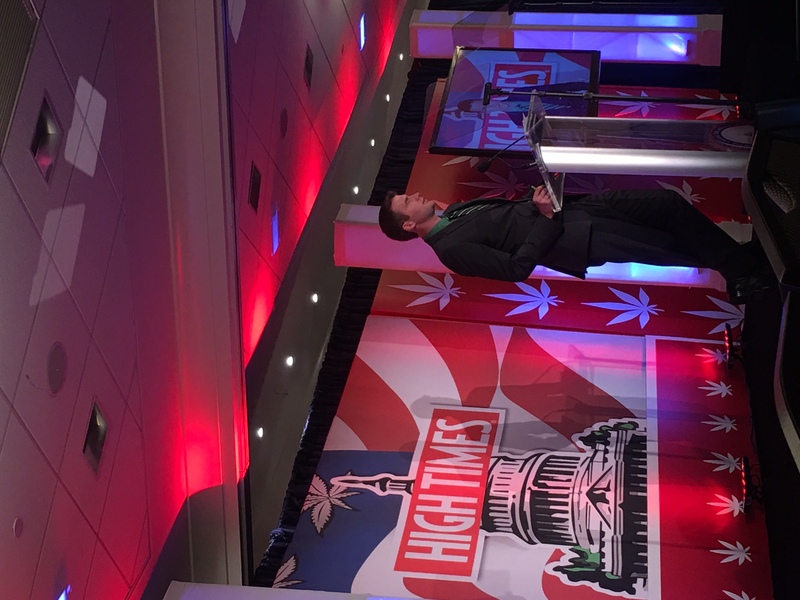 Through his involvement he is able to promote sustainable, sensible practices and policies that drive cannabis cultivation and industry best practices into new realms of productivity, profitability, and professionalism. We were able to sit down with Nic Easley after the conference to get some better insights for how the industry performed in 2015 and what is in store for 2016. CannabisIndustryJournal: How do you think Colorado’s year of pesticide recalls will help shape the industry’s future? Nic Easley: As a member of the Pesticide Advisory Committee with the Colorado Department of Agriculture, I think there is a tangible need for better, more comprehensive regulatory guidance. If we come out with strict pesticide regulations, it will be better for everyone in the industry and consumers, but more importantly it will benefit patients gaining access to safe, laboratory-tested medicine. The regulators will need our help to write the rules. Harder laws are good for us though, because the ethical businesses will always take the route of integrity, as opposed to the businesses that cut corners. Those companies not playing above board will be weeded out and reprimanded in due time. A lot of it comes with the responsibility as a grower and producer to facilitate medical needs, that is a responsibility that requires great integrity. As for the testing regulations, there are too many conflicts of interest and we need to look toward third party testing and accreditation to prevent laboratory shopping, skewed results and other inconsistencies. We need to not allow producers to provide their own samples, sampling and sample preparation needs to be controlled through third party laboratories working above board, as opposed to labs wanting to keep clients instead of providing accurate and consistent test results. Looking forward to 2016, we will continue to see the pesticide issue shape the industry, for better or worse, this is a problem we need to find the right solutions for and that comes through working with regulators, like the Colorado Marijuana Enforcement Division, to write the required regulatory framework. CIJ: Looking nationally, what major trends were highlighted in 2015 and what would you like to see change for 2016? Nic: With Oregon going online October 1st, and Maryland’s license application process opening up, we are recognizing some diminishing barriers to entry in markets previously difficult to tap due to things like residency requirements and where the capital came from. Maryland’s infused product and processing licenses are much more readily available as opposed to the cultivation licenses due to stipulations. States like Oregon and Alaska that dragged their feet a little with regard to their regulatory model, are just releasing a lot of barriers to entry for licensing applications. Oregon may have missed some tax revenue in the initial launch of the program, but they are doing it right through diligent research instead of using their citizens as guinea pigs. For businesses looking to get started, you can avoid poor decision making by knowing the rules. New and established businesses alike need to take the responsibility to write the rules to be socially, environmentally and economically responsible. If we want to make money in this industry to help the government’s role in keeping us safe, then doing business in the most socially responsible way possible will lead to profitability. What I would like to see change for 2016 is the expanding list of qualifying conditions. As a military veteran, I would like to see Colorado stop looking at the tax revenue of adult use cannabis, and make PTSD a qualifying condition for medical marijuana. The Bob Hoban lawsuit suggests that Colorado is marginalizing medicine because they will make more tax revenue by blurring the lines of adult use and medicine. All of the studies out there, including Dr. Sue Sisley’s work, suggests PTSD can be treated with medical marijuana. That highlights another trend I would like to see change in 2016: We need clinical research on these conditions, because observational research just is not credible enough. We [businesses in the industry] need to actively promote the need for clinical research to help propel social change and get the information and knowledge out there. With the right information, this industry can make informed decisions that will help all stakeholders. 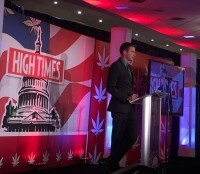 CIJ: What advice can you offer to cannabis businesses for 2016? Nic: I tell my clients that, because cannabis is still federally illegal, you must understand the present risk associated with the work you are doing. We need to ask questions like how can we do this responsibly and set a good example so when the time comes, the federal government will look to us as a legitimate industry, working with regulators to write the rules for safety. For new businesses, produce the safest, highest quality, and affordable medicine and work with other businesses and regulators to keep innovating in the area of safety. Focus on the structure of your business: build your foundations and using expert advice, you can avoid major pitfalls and become the leaders in this brand new industry. Look for environmentally sustainable solutions, climate change issues need to be addressed in this industry. Use appropriate technology instead of burning coal to grow marijuana, which increases our carbon footprint. This includes both environmentally sound standard operating procedures and the right technologies, but also social justice. We are presented with a terrific economic opportunity to work on climate change issues, so work to address inefficient practices and innovate to be as sustainable as possible. CIJ: For the entire cannabis industry in 2016 , what kind of growth do you expect? Nic: We have reached a point where I foresee a holding pattern beginning to take shape. In 2016, the industry will continue to grow and demand will not be satiated by supply. August of 2015 was the first month when Colorado saw over $100 million in sales. We will increasingly see more price fluctuations as bigger projects come online. Many states in 2016 will focus on problems with their regulatory models and devising solutions for them. Businesses will continue their strategic growth planning, with key states potentially coming online for adult use such as Nevada and California. Nevada is one of the most up and coming markets in America with a 68% approval rating, and they have the ability to grandfather in businesses and previous rules associated with their medical marijuana program. Knowing licensing applications can take eight to eighteen months before you can become operational, we have to place our bets wisely. There is a lot happening in all these states and from the big November votes on, chaos will ensue as regulators tackle big problems with the overhaul. In 2016, the cannabis industry will make a big impact on the United States, and the exciting part is that progress is made through business as usual for us.